ANNAPOLIS, MD (September 2, 2010) – Cogon grass (Imperata cylindrica), a perennial grass from southeast Asia, is considered one of the 10 worst weeds in the world. Covering billions of acres worldwide, it is well established in the southern United States as far north as Virginia. Cogon grass was accidentally introduced to the United States early in the 20th century as packing material in Japanese orange crates. It was first found growing wild in Alabama in 1912. Later in the century, it was purposefully imported from the Philippines as a forage grass, but it didn’t measure up as fodder. The cultivated variety ‘Red Baron’, or Japanese Blood Grass (Imperata cylindricavar. rubra), originally thought to be sterile and widely sold as an ornamental plant, has been found to revert to an aggressive, green form, and even in its red form, to produce fertile seed and new seedlings. Because I. cylindrica is a listed Federal Noxious Weed, a federal permit is required to move it interstate. According to United States Department of Agriculture (USDA) policy, the receiving state must concur with the permit. On the basis of recent genetic analyses and local observations, the Maryland’s Department of Agriculture no longer concurs with the issuance of a permit to import any cultivars of I. cylindrica into Maryland for the horticultural trade. Because of its new unwanted status in Maryland, MISC has declared cogon grass to be the September Invader of the Month. Cogon grass has stems that grow as tall as six feet, though plants usually range from two to four feet. Each leaf blade is about ½-3/4 of an inch wide, bright chartreuse green (except red cultivars) with a slightly off-center bright white midrib. The leaf blades are flat, with a sharp tip and fine sharply toothed edges lined with tiny silica crystals – one of the reasons why it did not become a prized forage grass. Cogon grass reproduces both vegetatively, through long sharp white rhizomes that branch easily and send up new plants, and sexually, through foot-long silky white cylindrical spikes of flowers. Although both female and male flowers occur on individual plants, two different plants are required to get seed development. In temperate climates, cogon grass flowers in the spring; in subtropical or tropical climates, it may flower year round. One plant may produce as many as 3,000 seeds, which are wind-dispersed by plumes of long hairs attached to the bottoms of the seeds. The red cultivated varieties are generally smaller than the green wild type, and until recently, were thought to be sterile. This grass typically invades areas of human disturbance such as roadsides and surface-mined land, but also thrives in dry, sandy natural conditions such as savannahs, on leached, acidic soils with low organic content. Different biotypes of the grass prefer wetter or drier, and generally sunny conditions. The red cultivars grow better in cooler, moister conditions. They also seem to stay decoratively red better in more northern habitats; early reports of the reversion to all-green forms came from warmer, more southern sites. Within the last several years, however, reports of reversions of ‘Red Baron’ to a green form have appeared in Maryland. The wild green type has not been documented in Maryland. Both the green wild type and the cultivated red forms of Imperata cylindricapresent invasive threats in Maryland. In the wild, cogon grass forms mats of thatch that cover and shade out native plants. Because it is highly flammable when dry, but the rhizomes can withstand the heat of fires, it can alter the regime of fire-adapted ecosystems such as Florida bunchgrass communities. It spreads rapidly and covers huge areas; in 2008, almost 50,000 acres in 12 southern US states were estimated to be infested. 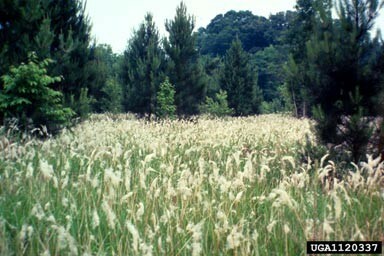 Shorter herbaceous plants in Mississippi pine flatwoods were shaded out and displaced by cogon grass. Researchers have found that cogon grass produces toxins that can affect the growth of other plants, another way the invader may affect native species. Genetic comparisons of the wild green cogon grass, the cultivated red form and the reverted-to-green form, done by Dr. Sharon Talley of USDA Animal Plant Health Inspection Service (APHIS), found that the red cultivar and the reverted green form of it are the same genetically. The reversions have substantially larger rhizomes than the red cultivars, and the plant spreads easily by rhizome. 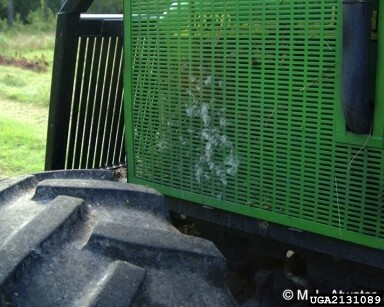 The APHIS scientist concluded that “rubra varieties have the potential to become invasive.” The grass seeds are wind-dispersed, and can be easily transported on vehicles or the kind of heavy equipment that Maryland sent to Louisiana to help clean up after Hurricane Katrina in 2005. The cultivar ‘Red Baron’ is now reported to be reverting to a green form and to be producing viable seed in Maryland. It is a widely planted popular ornamental. Chemical control methods are usually recommended for cogon grass, since its rhizome mass and expansive stands make it virtually impossible to remove by hand weeding. Several fungal pathogens have been explored as biocontrol agents, but because they do not affect the plant rhizomes, they likely are useful only as part of an integrated vegetation management approach. A gall midge from Indonesia may have some promise, but it is primarily a foliar feeder and does not kill cogon grass rhizomes. In southern Africa, the leguminous species Mukuna, planted as a cover crop, has some suppressive effect. Burning unfortunately may stimulate growth and flowering of the grass. Suggested chemical controls include grass-selective and non-selective herbicides; Contact your local forestry office or University of MD Extension office for specific recommendation and as always follow label directions.